Can Southwest Key bounce back from state freeze? With an admissions freeze imposed on Southwest Key by state health regulators in effect for more than 100 days, the nation’s largest operator of shelters for migrant minors now houses fewer than 250 youth in Arizona. That is less than 25 percent of its capacity in Arizona. The Arizona Department of Health Services, which licenses Southwest Key’s operations as residential behavioral health centers, placed the restrictions on Southwest Key on Oct. 24 as part of a settlement. The admissions freeze affects all of the company’s 11 facilities. Three months later, ADHS said lifting the admissions hold is under review on a facility-by-facility basis. Southwest Key CEO Juan Sanchez requested a lift on restriction in a letter to ADHS on Jan. 11. “Southwest Key Programs has completed a rigorous internal review of our facilities and programs and has fulfilled all terms of our Settlement Agreement,” he wrote. The company has hired a healthcare management consultant to vet all of its Arizona facilities and evaluators for each of its sites. With the vacuum created by Southwest Key’s admissions hold, another Arizona operation is expanding to meet the government’s need for shelter space for migrant minors. A New Leaf, which runs two facilities in Mesa and currently houses 40 migrant minors, is in negotiations with the federal government to expand its operations, said spokesman Kyle Harris. A New Leaf made $3.7 million in its contract with U.S. Department of Health and Human Services for housing migrant youth last fiscal year. A $1 million expansion grant was approved on Nov. 30 for this year, according to HHS. The Uncage and Reunite Families Coalition, a local community organization that has pushed for more state oversight and reforms at migrant youth shelters, said the Southwest Key reviews have been on their terms, and without enough transparency. Arizona Mirror requested records from ADHS on Southwest Key’s on-site evaluators’ job duties and terms of employment, which the agency is required under the settlement to review and approve before they begin their work. ADHS said it had no such records. Scott said the community group continues to push for a citizens oversight committee to monitor the private operator. Meanwhile, unaccompanied migrant minors continue to arrive in the country to seek protections, and the number of migrant children and teens in government custody recently reached new heights. The youth in facilities like Southwest Key are migrants, mostly teenage boys, who arrived in the US alone or were separated from their parent after entering the country. They come mainly from Guatemala, Honduras, Mexico and El Salvador. The children and teens are placed in residential facilities contracted by HHS’s Office of Refugee Resettlement. They are in the shelters while pending reunification with their families or release to sponsors in the US. The average stay in those facilities is 60 days, according to HHS numbers from last fiscal year, but the Associated Press reported that figure reached 89 days in October. Between October and December, more than 16,220 unaccompanied youth crossed the southern border and showed up at ports of entry, according to the latest figures from U.S. Customs and Border Protection. The AP reported the number of migrant minors in government custody reached a record 14,314 in December — and 818 (or 6 percent) of them were in Arizona. ADHS told the Mirror on Jan. 23 that the population at Southwest Key’s facilities was below 250. Southwest Key is licensed to serve 1,035 children at 11 facilities in Arizona. The non-profit has shelters in Arizona, California and Texas — where 75 percent of its operations are located — with an overall capacity for 5,013 migrant youth, said company spokesman Jeff Eller. As a result of the state-imposed admissions restriction, the Maricopa County Regional School District, which provided educational instruction at four of Southwest Key’s shelters, saw its student enrollment decline by half in a two-month period, said district spokeswoman Laurie King. “We had lost over 200 kids in the course of a week,” King said. The trend continued, and at the end of November, the district ended its partnership with Southwest Key. The district cut 20 jobs, among them 12 teaching positions, two administrators and six classified staff positions, she said. “We were employing individuals without the student population to pay for those positions,” King said. She said if regular operations at Southwest Key resume, the district won’t contract with them again. Southwest Key received $626 million in HHS grants in fiscal year 2018, and $121 million have been approved for this year. 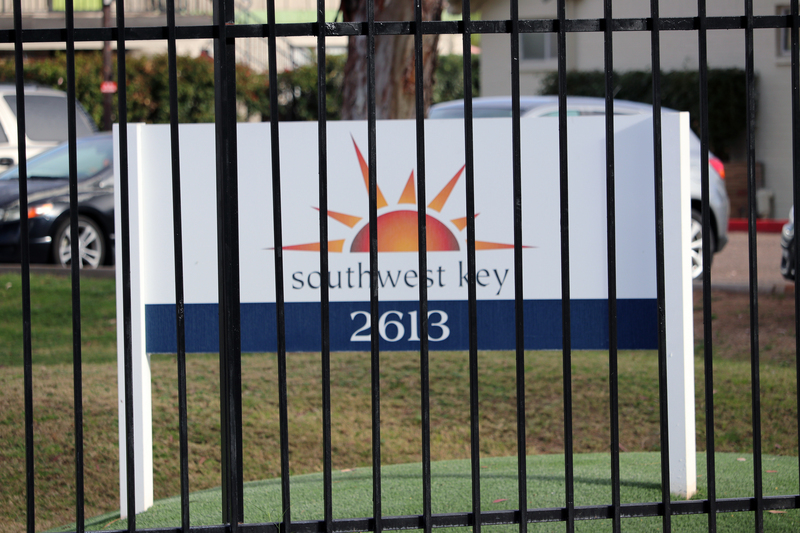 It is unclear whether Southwest Key has lost federal grant funding since it hasn’t received new children in its Arizona facilities since October. HHS said in a statement that Southwest Key’s funding is based in part on capacity. Eller, the spokesman for Southwest Key, declined to comment on the effect the Arizona admissions hold has on the company’s business and operations. “Because we’re still working through the settlement, we would decline to comment,” he said. In Arizona, scrutiny of Southwest Key’s operations began in the summer. Media reports uncovered instances of sexual abuse at its shelters. Gov. Doug Ducey ordered inspections of all facilities in August, and those turned up consistent inefficiencies in background check records and training requirements, in violation of state statute. ADHS gave Southwest Key a month to verify and show evidence it had proper records. Will Humble, a former director of the state’s health agency, said this was unusual. Southwest Key failed to meet the deadline to provide evidence, and later provided deficient records. ADHS Director Cara Christ chastised the company in a Sept. 19 letter and moved to revoke all of its licenses. A few days later, on Sept. 28, HHS shut down a facility in Youngtown licensed for 133 minors after reports of staff physically abusing three minors. ADHS and Southwest Key reached a settlement Oct. 24, and the nonprofit surrendered licenses for the Youngtown facility and another in central Phoenix — Casa Phoenix, which had space for 420 children and was the company’s largest facility in Arizona. Between Sept. 28 and Oct. 24, Southwest Key’s capacity in Arizona went from 1,588 to 1,035 — a 35 percent reduction. As part of the settlement, ADHS can make unannounced inspections on Southwest Key facilities for two years. A Senate proposal recently introduced would strengthen background check requirements for facilities like Southwest Key and give ADHS authority to inspect them unannounced.